Xi'an has a 6,000-year history and was known as Chang'an in ancient times.During 1,000 years the city was capital for 13 dynasties, and a total of 73 emperors ruled here. With so much history within the ground the city lies upon, it is no wonder that there are so many historical ruins and, in the museums, cultural relics. Even before the lives of Christ, Mohammad, and Siddhartha, Xi'an was a world class city and already influencing the world outside of The Great Wall of China. As the eastern terminus of the Silk Road), traders from far and wide brought goods and ideas for sale and took goods and ideas back with them to their communities. In present day Xi'an not much of its former glory remains within the city confines due to the constant warfare and political changes particularly throughout the 2Oth Century. 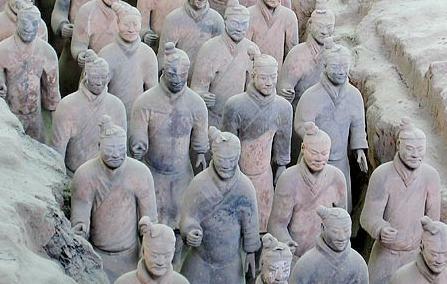 However, this clean and modern city has a pleasant cosmopolitan flare to it and it is worth visiting for the famed Terracotta Warriors alone. It has often been said that "If you have not been to Xi'an, you have not been to China!". One of China’s leading sightseeing cities, Xian has long been on the World heritage list’. For Qin Shi Huang, contributions to recently united China involved sacrificing the lives of thousands of labourers to create visionary projects, which now mark the city as one of vast historical, cultural and archeological importance.The main tourist attractions include The Terracotta Warriors and Horses, Big Wild Goose Pagoda, Small Wild Goose Pagoda, Huaqing Hot Springs, Banpo Museum, Stele Forest, Great Mosque, QianLing Mausoleum, Famen Temple and Maoling Mausoleum. The central city is compact with a grid layout within the city walls making it easy to navigate around. The surviving architecture opens a window into the imperial power and the cosmopolitan style of the old capital. The Terracotta Warriors signify a small portion of the eight thousand soldiers who were buried underground in front of the Emperor Qin Shi Huang's tomb (r. 221-207 BC) to defend him in the afterlife.Considered by archeologists to be the most significant archeological finds of the 20th century, the Terracotta Warriors subsequently put Xian firmly on the map. The site was listed by UNESCO in 1987 as one of the world cultural heritages, and is considered to be the eighth wonder of the world. Xi'an was originally a walled city, and even today the wall is considered to be a landmark dividing the city into the inner part and the outer part. Built in 1370 during the Ming Dynasty, the wall is 12 metres high and 18 metres thick. The South Gate and North Gate are the two main entrances to the inner city and were once the only way to get in and out of the city and thus played important strategic roles. They are usually the first landmark encountered by visitors. The northern side runs parallel to the railway. Visitors can either walk or cycle around the site. Built in AD 652 to house Buddhist scriptures that had been brought back from India, The Big Wild Goose Pagoda is situated in the Da Ci'en Temple, about four kilometers from the centre of town. Considered to be one of Xian's most popular attractions, it is built in a simple but appealing style, the architecture has been well preserved although undermined by the force of Nature over the years. It is rated as a National Key Cultural Relic Preserve as well as an AAAA Tourist Attraction. Surrounding the pagoda is Da Ci’en Temple, one of the largest temples in Tang Chang’an. The Drum Tower in Xian was initially built in 1380 during the reign of Emperor Hongwu of the Ming Dynasty (1368-1644), and was renovated twice, in 1699 and 1740 in the Qing Dynasty (1644-1911). It is a two-storied post-and-panel structure, 34 metres high and 52.6 metres long from east to west as well as 38 metres wide from north to south. Taking its name from the huge drum within it, the site is worth visiting especially for the sprawling panoramic view to be enjoyed on reaching the top of the tower. This building marks the geographical centre of the ancient city. The wooden structure is the largest and best preserved of its kind throughout the whole of China and seeks to reflect Xian's one-time role as a military town during the Ming Dynasty. Dating back to the 14th century, like the drum tower, it was rebuilt in the 17th century and musical performances are staged here daily between 09:00 am to 11:30 and 14:30 to 17:30. During the Tang Dynasty, the Small Wild Goose Pagoda stood across a street from its mother temple, the Dajianfu Temple, built in AD 684. Indian pilgrims brought sacrificial writings to the temple and pagoda, as the temple was one of the main centres in Chang'an for translating Buddhist texts. The pagoda has a brick frame built around a hollow interior and its square base and shape reflect the building style of other pagodas from the era. Visitors can admire a sprawling vista of Xian from the top. A perfect fusion between Chinese and Islamic architecture, the mosque faces west towards Mecca as opposed to the usual southerly direction. Comprising Chinese temple features and a surrounding landscape laden with pagodas, rocks and archways, the four palm trees at the entrance show an Arabic influence. Founded in the 8th century, the mosque was designed to fend off evil spirits. The prayer hall is normally closed to non-Muslims and as this is an active mosque, be cautious in taking photographs. The temple is surrounded by souvenir stands. The Muslim Quarter is a myriad of narrow streets laden with handicraft shops, Muslim restaurants and street vendors selling souvenirs and traditional foods. Situated next to the Drum Tower, the area features a mixture of Chinese and Islamic cultures, occupying a fraction of the area it once did. It remains popular with tourists and locals who choose to hang out on the streets amongst the comforting smell of street food. The Xian Great Mosque is the most impressive of the area's attractions, built in 742 AD during the Tang Dynasty the structure is a fantastic fusion of Chinese and Islamic architecture, making it one of the most distinctive mosques on the planet. This is where the majority Xian’ s Chinese Muslims reside and have done since the Ming Dynasty. Dating back over 6,500 years and discovered in 1954, the Banpo Site is a showcase of a typical Neolothic matriarchal community belonging to the Yangshao culture. The newly renovated Museum measures almost one acre in size and is divided into two exhibition halls and a site hall. Exhibition pieces focus on production tools including axes, chisels, stone and pottery knives. Artworks seek to illustrate the social life, culture art and innovational practices of the period. Archeological findings are also present; the museum is a reflection of primitive production levels and social practices. Built during the Northern Song dynasty, it is situated near the south gate of the Xian City Wall. Initially built in AD 1087, when precious stone steles were housed here for safekeeping, including; the Classic on Filial Piety written by Emperor Xuanzong in AD 745 and the Kaicheng Stone Steles carved in AD 837. Occupying an area of 31,000 square meters, the Forest of Stone Steles has been the principal museum for Shaanxi Province since 1944. The second exhibition hall holds a Nestorian tablet (AD 781) the earliest recorded account of Christianity in China. Qin Shi Huang was responsible for the unification of China. Buried in his mausoleum amongst the Terracotta Army, the structure took 16,000 men to build and is pretty impressive to say the least. Considered as a pioneer and over achiever, he implemented amongst other things a centralized government in his 36 years of rule (which would go onto guide other dynasties) and overthrowing six major kingdoms before the age of 40. The Emperor supposedly took criticism so badly that he buried 460 disapproving Confucian scholars, alive. With a history of over 1,600 years the temple belongs to the Jin Dynasty and plays an important role in the position and early roots of Buddhism. The harmonious architecture and spiritual atmosphere have a warming affect on visitors. The actual Buddha statue is housed in a stone cave of the Xian rock on Shicheng Hill- it is considered the first big Buddha south of the Yangtze River. Here stands the magnificent Hall of Sakyamuni, the central area of the Big Buddha Temple. Northwest of the temple (about 300m) stands One Thousand Buddha Temple, where there are over 1,075 statutes ranging in size from several inches to one metre high. Located approximately 76 kilometres (1.5 hours) from Xian, the centre is the first crested ibis (one of the 50 rarest birds in the world) breeding centre in China. Other animals include giant pandas, golden monkeys, black bears, leopards, giant salamanders, peacocks, antelope, white lipped deer, musk deer, vulture and owls. Folk Paintings,Calligraphy Rubbings,Paper Cutting,Green Porcelain,Terracotta Warriors,Tang Pottery Replicas. Ancestor Worship in Mausoleum of the Huang Emperor,Xian Art Festival of Ancient Culture,Mt. Hua China International Rock-climbing,Xian City wall International Marathon,Xian International Calligraphy Annual Meeting,Xi'an Terra-cotta Warriors and Horses Figures & Pomegranate Festival.